A wee blog that's all about the whisky and the craic!! On Saturday 20th May 2017 Redbreast Irish Whiskey treated 100 fans to a very special tasting to coincide with the celebration of World Whisky Day. The tasting was a sample of single pot still Irish whiskey drawn from a cask chosen by Midleton master blender Billy Leighton as his "Dream Cask". Prior to the tasting nothing was given away, even when the selected tasters received their tasting sets all they had to go on was an unmarked 100 ml bottle filled with the mysterious whiskey. It was clear we would just have to wait for the event itself. 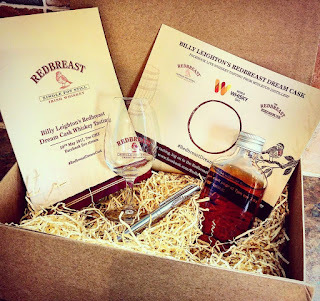 The method in which the tasting would be conducted would also be unique as Redbreast decided they would stream the tasting live via Facebook from warehouse A1 in the grounds of Midleton itself, thus making the event accessible to everyone across the globe, albeit without the magical whiskey. 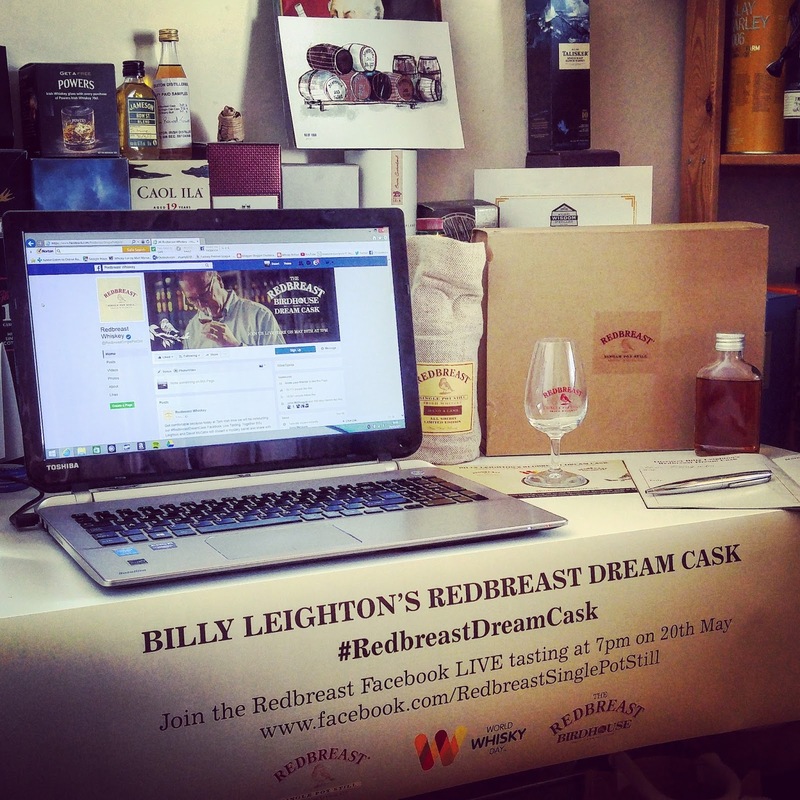 On the night in question I made sure to have my sample ready and laptop fully charged to take part in this event and at 7pm BST the Redbreast Facebook page sprang into life with the live stream being hosted by Billy Leighton and Dave McCabe. As the stream got going we didn't have to wait too long to find out exactly what it was we would be tasting and the revelation was astounding to say the least. What we had in our hands was a 31yo single pot still Irish whiskey that was distilled in October 1985. It had spent 25 years in an ex-bourbon cask before being re-casked in 2011 into an ex-sherry cask. The natural cask strength was 46.7% ABV and if you are really interested the cask number was 41207. Excited would not even cover exactly what I was feeling as this was going to be the oldest Irish whiskey I had ever tasted since sampling some 28yo Redbreast at a tasting at Whiskey Live, Dublin a few years ago. As I listened on intently it soon became clear that this sample of 31yo whiskey was essentially the same as that 28yo I had tried previously only with 3 years extra maturation under it's belt. When Redbreast 21yo was first launched in 2014 it was known to contain whiskey of up to 28 years of age. This 31yo sample was from the same batch that would have first been used to create the Redbreast 21yo. I hope that explains things ok. It was now time to delve into the whiskey and it did not disappoint. Nose - Rich, deep and creamy with vanilla. Gentle pot still pepper spice. Red toffee apples with the red berry fruits still extremely vibrant. Naturally with time it became darker with full Christmas cake flavours, raisins, fig rolls, stewed berries and a little hint of something tropical. Stewed oranges were also present and with time a distinct note of ginger snap started to appear. Palate - Just as rich as the nose yet deliciously smooth. Ripe banana, blackcurrant jam and further pot still spice. The liquid fills the mouth and brings a glorious lip smacking dryness but in no way have the casks overpowered the spirit. You almost have to chew through this one. With time some notes of dusty old leather backed books started to appear giving a true sense of the age. Simply stunning. Finish - Long and lingering with red apple, dark berry and delicious warming spices. Overall, words can not accurately describe how good this whiskey is. It truly is in a league of it's own. The flavours come at you layer upon layer with each one playing it's own part and working in total harmony with the next. It is a whiskey you would need a few months with before you could even begin to really get to know it. Towards the end of the tasting a question was raised asking what would happen with the rest of the contents of the barrel that this sample had been drawn from and it was suggested to put pressure on the powers that be at Midleton to maybe get this released as a single cask release. I can tell you one thing, if this ever gets released as a single cask bottling the price will be astronomical but it will also sell out in hours, if not minutes. My advice to everyone is start saving now, hope the time comes that this is released as a single cask bottling and then get in line with your fingers crossed. I would also like to touch on the tasting again and say that in my opinion this was a huge success. 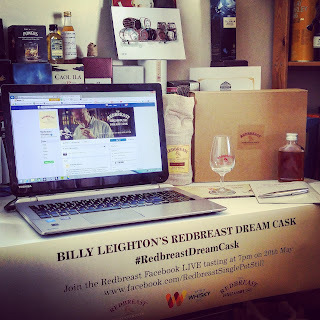 The tasting was interactive and enjoyable and I certainly hope Redbreast continue to host these Facebook Live tastings, maybe next time they could stretch it out even longer to maybe an hour or so. This is an excellent way for them to connect with fans all over the world and continue to raise the profile of Irish whiskey in a way that is fun, entertaining and engaging while also allowing people the rare opportunity to ask a Midleton master the question they've always wanted answered. Lastly I would like to thank Redbreast for the chance to take part in this once in a lifetime tasting that I'll remember for many years to come. Back in 1780, when the Jameson Distillery Bow Street was first established, I'm sure John Jameson himself would never have believed how the building would look now. Throughout it's 200 plus years history the Jameson Distillery has been through many ups and downs and eventually it came to pass that the distillery would close in 1971. It then lay in it's dormant state before opening in 1997 as the Jameson "brand home". 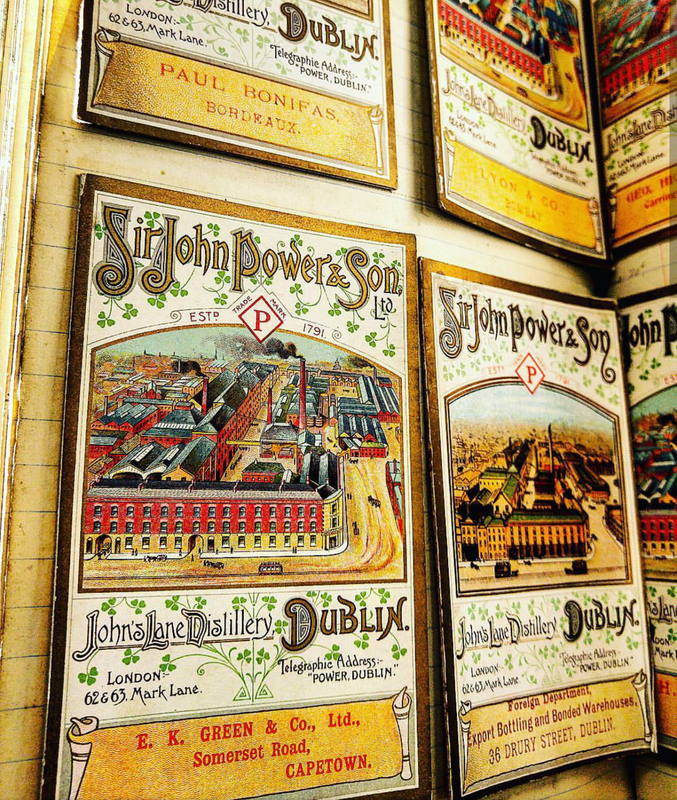 Since then the distillery has served as a Dublin tourist attraction, attracting over 4 million visitors in that time, while providing much needed employment to the area. As with any attraction it's only a matter of time before serious investment is needed and that is what I am writing about today, as on 6th March 2017 Jameson celebrated the re-opening of Jameson Distillery Bow Street after the completion of a massive renovation as part of an €11 million investment. 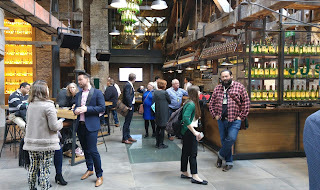 At the end of March I made the short journey down to Dublin to see for myself how the distillery was looking and to take part in the tours and experiences they have on offer, while also getting the rare chance to chat to some people who are rather important when it comes to all things Jameson. 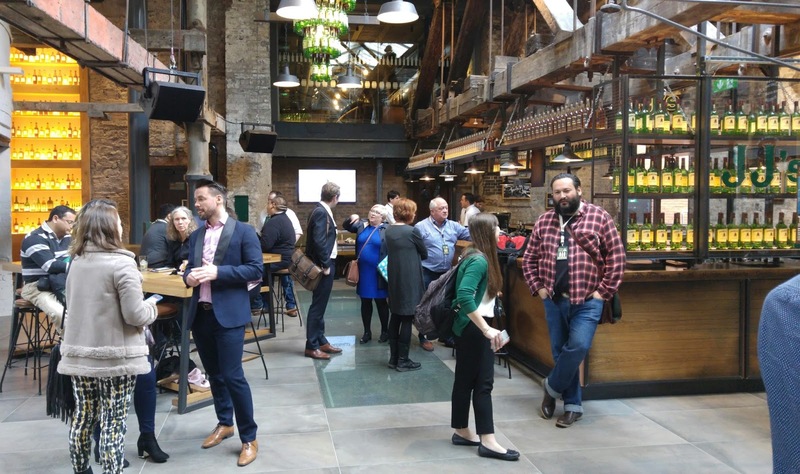 Upon arriving outside Jameson Distillery Bow Street not much appears different but when you walk through the doors you instantly start to see where a lot of the investment money went towards. The main bar / front hall is huge compared to the way it looked before and given that there would have been no room to expand the building itself, you wonder exactly where they found all the space. It is bright, airy, welcoming and relaxed, and from talking with some of the staff this is backed up by stories of the general public just simply coming in to have a look and enjoy a drink under one of the impressive Jameson bottle chandeliers. This allows people to come in and see what the building is all about without feeling too intimidated, or pressured into having to buy any tickets straight away. The renovation has also allowed the distillery to accommodate a much larger volume of tourists and upon speaking with Ray Dempsey, general manager of Jameson Distillery Bow Street, he confirms that previously, at busy times of the year, they could have had a 2 hour delay for people waiting to take a tour around the distillery but now they are able to accommodate 30 people every 6 minutes. This all ties in with the Irish Whiskey Tourism strategy aim of attracting 1.9 million whiskey tourists to Ireland annually by 2025. As we continue to chat with Ray Dempsey we get a sense of what to expect on the new "Bow Street Experience" tour. He describes how more and more people are keen to learn the story of Jameson whiskey and how they are only too eager to tell that story. He explains how he feels the tour to be truly interactive, calling it a "total sensory experience". He also gives us a little insight into the fact that they now have two extra experiences to compliment the signature "Bow Street Experience". Jameson have gone all out to give tourists a true insight into the spirit of Jameson with their "Whiskey Makers Experience" and "Whiskey Shakers Experience", where for a very reasonable price you can either look at an in depth deconstruction of the "Whiskey Makers" series of whiskeys or see what it takes to become a top notch mixologist by hand crafting 5 of you very own cocktails. He also highlights one last aspect that is also included in either of the aforementioned "Experiences" where you will get the chance to visit Bow Street's own 88 cask maturation warehouse, where they have brought back some of the whiskey making process to Bow Street. Suitably impressed with the information provided so far we then got started onto the "Bow Street Experience" tour where we would look at not only the history of Jameson but also the whiskey making process as a whole. For this special occasion we were lucky enough to have Carol Quinn, archivist at Midleton Distillery, take us through the rich history of Jameson. 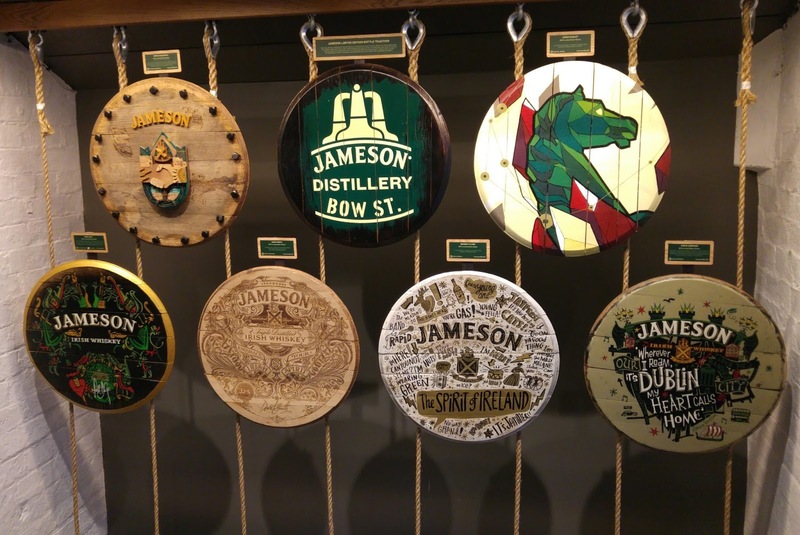 Previously there was nothing of note to really explain the history of Jameson so it was great to see a beautiful gallery / timeline showing us exactly how Jameson came to be the brand it is today. From here we are then led into a story room where the story of Jameson is further told through the use of fantastic visual and audio displays. The whole experience is both striking and engaging. We then move into the next room to look at the whiskey making process. Now, I have been on many tours and I can honestly say that this is the most complete and interactive explanation of the whiskey making process I have ever seen. 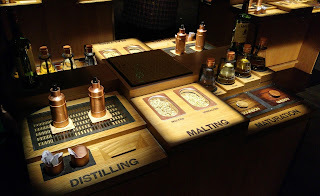 As you enter the room you are immediately struck by the sight of numerous interactive stations where you have everything from malted barley to hold and taste, to atomisers containing different new make spirits to compare their smells, to mock barrels that allow you the chance to nose the difference between bourbon and sherry, to visual aids to show you the different colour through the maturation process. This is all done while an enormous video wall takes you through the whiskey making process in crystal clear fashion that even a 2 year old could understand. All very impressive and it is quite clear that no expense has been spared in bringing tourists that "total sensory experience" that we heard of upon our arrival. We then made our way into a gorgeous tasting room to try Jameson whiskey alongside a standard Scotch and standard American style whiskey. 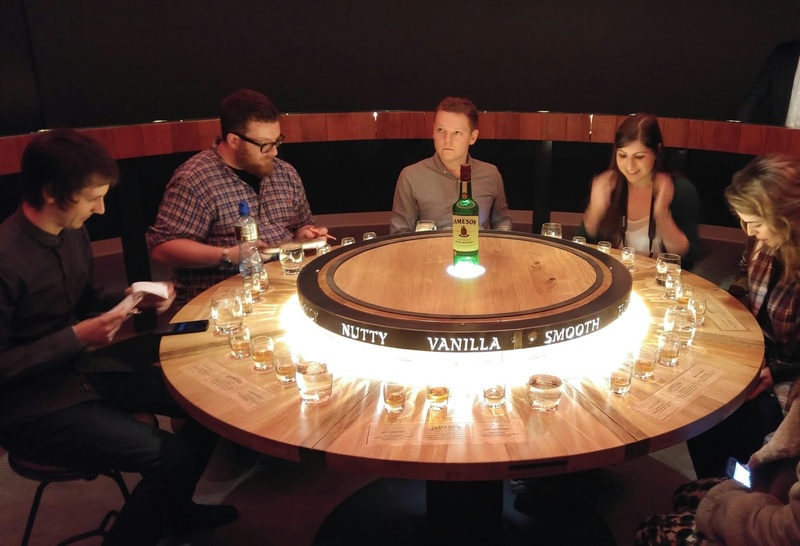 Now while this part of the tour has not differed from what had gone before it's new surroundings have elevated the tasting to be more inclusive and allowing everyone the chance to sit around a table together and enjoy some top class whiskey. That brought us to the end of the main "Bow Street Experience" tour and now it was time to take part in one of the other experiences. For this, I was selected to go onto the "Whiskey Makers Experience" and it's fair to say that probably suited me best. As much as I love a good whiskey cocktail, I wanted to see how much further Jameson could take the experience of learning about whiskey itself. For this, we were led into a tasting room where each participant had an array of whiskeys and other items laid out in front of them. Our host for this experience was Christopher and he explained how he would take the next 90 minutes to really showcase the "Whiskey Makers Series" and explain how they came about. 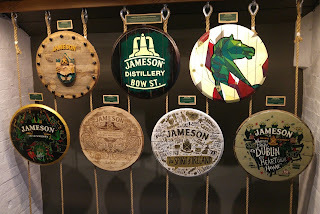 Throughout this whole experience there was a lot of emphasis put on the word "craft" and how the "Whiskey Makers Series" really displays the craft of Jameson as a whole. We go through every aspect you could think of from how to taste whiskey, to the whiskey making process and even more history of the Jameson brand. As I'm sure you may have noticed, I recently attended the Irish Whiskey Academy in Midleton and I have to say, this masterclass is taking that experience and making it accessible to all through this "Whiskey Makers Experience". Every aspect is covered and it's just as interactive as everything else we had seen with nosing bottles, food pairings and even a blending exercise to be enjoyed by all while the host asks many questions to both test your knowledge and seek to improve it immeasurably. The whole tasting was perfect from start to finish and the chance to blend your own whiskey is something that is sure to be a huge hit amongst the tourists who come through these doors. Just to quickly touch on this aspect we were given 3 samples each and encouraged to play around in whichever way we wished to create that perfect blend. The samples available were a 4yo grain whiskey matured in a second fill bourbon cask, a 8yo pot still whiskey matured in a first fill sherry cask and a 6yo pot still matured in a first fill bourbon cask. This finishes the "Whiskey Makers Experience" off and of course you can take your finished blend away with you. Following this we then met back up with the group taking part in the "Whiskey Shakers Experience" and we headed downstairs to go into the maturation room. Being the first maturation warehouse to be in Dublin for 42 years, this is an experience you wouldn't want to miss and if that wasn't enough there is also the chance to taste some whiskey straight from a cask. For this we were all allowed to try some 14yo pot still whiskey that had been distilled in 2003 and has since been maturing away in a second fill bourbon cask. As with any cask tasting, this was just simply delicious. That concluded the tours for the day and after a spot of lunch we were able to get a quick chat with Carol Quinn and Brian Nation, master distiller for Midleton. Speaking with Carol it was evident that she found it so important that the old distillery be maintained and open for all to see, as this allows Jameson to showcase the great history of Irish whiskey and the people who have guided it through good times and bad. She was also able to touch upon the fact that when the building was stripped back, to allow for the work to commence, she was able to work alongside architects to gain immense knowledge of how the distillery was first set up and structurally why it was laid out the way it was. She went on to also highlight that through her time at the archives in Midleton she has uncovered countless stories regarding the history of Jameson, and the people behind it, and it was great that these stories could now be passed on in even more detail to the general public. While speaking with Brian Nation I was able to ask him what it meant to him, as master distiller, to be able to come to the spiritual home of Jameson and he was truly honest when he said that, for him, it was an emotional experience. He went on to give credit as to how all the rich heritage of Jameson and the traditional whiskey making process had been displayed in such a modern way. I also got the chance to ask him what it meant to him to see the "Whiskey Makers Series" being highlighted in such an intense manner and he was quick to point out that the "Whiskey Makers Series" is about showcasing the craft of the process and the people behind it. 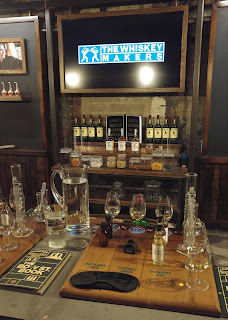 What is clear is that Brian, like myself, was extremely impressed with the "Whiskey Makers Experience" and he pointed out how educational it was to anyone, regardless of their whiskey knowledge. He fully agreed that this was just like taking the Irish Whiskey Academy and making that experience available to all. As I made my way home that evening I could not stop thinking about how impressed I was with everything I had experienced that day. From the moment you walk into Jameson Distillery Bow Street to the moment you leave you are bombarded with history, knowledge, flavours and experiences. Before the renovation this distillery was without doubt a must see attraction when you were in Dublin and what Jameson have done is taken that experience and enhanced it 100 fold. 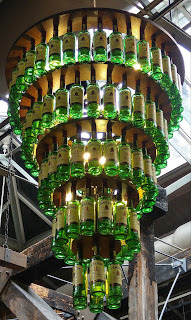 If you are in Ireland and you want to learn about Irish Whiskey then you need look no further than Jameson Distillery Bow Street. 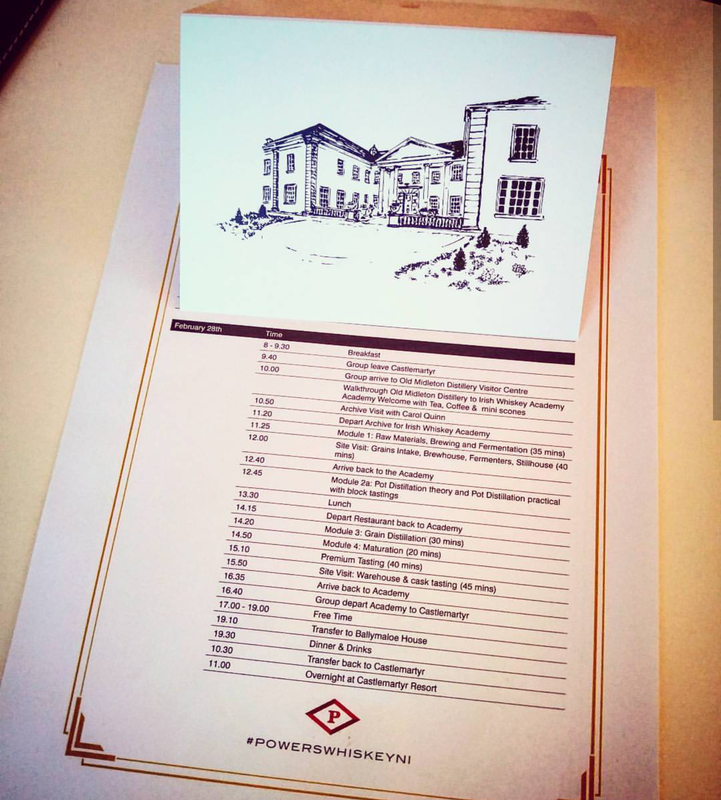 Towards the end of 2016 I was lucky enough to be invited to assist in judging a social media competition hosted by Powers Whiskey Northern Ireland. The "Whiskey Wisdom Distilled Challenge" focussed on bringing together bars from across Northern Ireland, through the power of social media, and have them complete a series of challenges that allowed them to showcase not only the Powers Whiskey brand, but also their own business. The competition resulted in entries being posted on social media (mostly Twitter) and, through the creativity of the teams involved, we were treated to a range of entries that varied from bordering on the professional to the downright hilarious, and I mean that in a good way. The competition tested the teams on their knowledge of the Powers brand and their ability to showcase Powers whiskey in a range of interesting scenarios and creative cocktails. In the end, however, there could only be one winner and after a hard fought contest the team from The Bullitt Hotel, Belfast came out victorious. 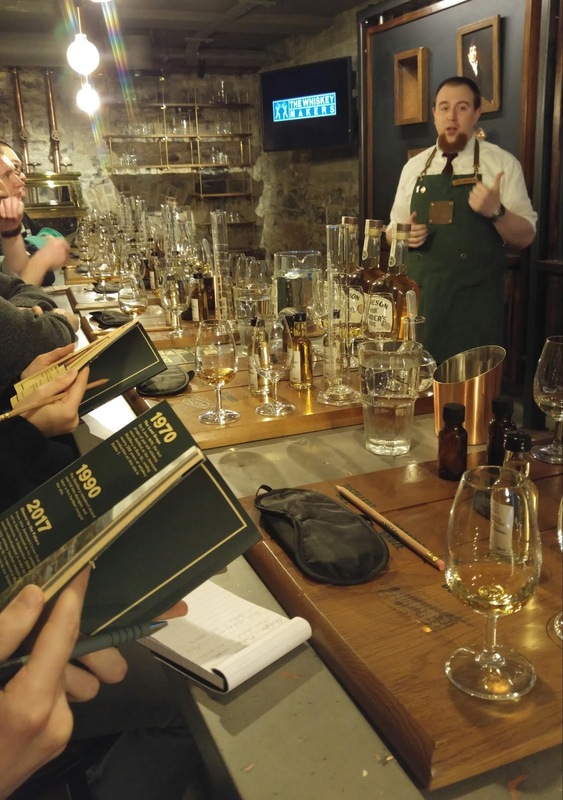 The prize for the winning team was the chance to be treated to the full two day "Enthusiasts Package" at the exclusive Irish Whiskey Academy in Midleton Distillery, County Cork. 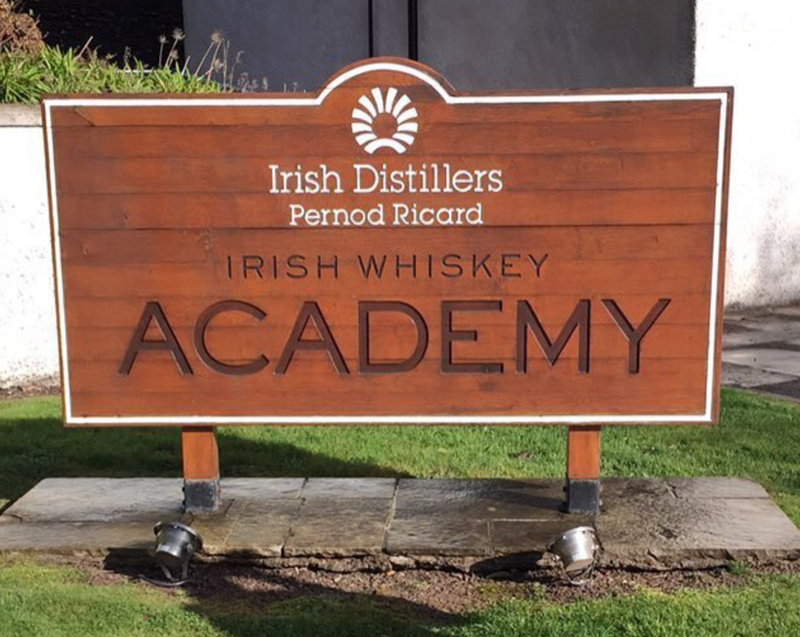 In a twist that I was not expecting, I too was to head down to the Irish Whiskey Academy to take part in the two day course with the winning team, not only as way of thanks for helping with the judging but to also take in the experience and bring it to you all through these words you are reading. On 27th February I made my way to the National Bar, Belfast where I was to meet the winning team who would also become my fellow "Enthusiasts" for the days ahead. The Bullitt team of Frankie, Alex and Conor were ready and waiting at The National and we were soon joined by Sarah from Dillon Bass and Joe Magowan, Powers very own Irish whiskey ambassador. As we travelled the 250+ miles to Midleton Distillery we had plenty of time to get acquainted and discuss our thoughts on what lay ahead. As I spoke with the Bullitt team it was clear that they each had a keen interest in finding out more about the Powers whiskey brand and the way in which it's whiskeys are created at the Midleton Distillery. 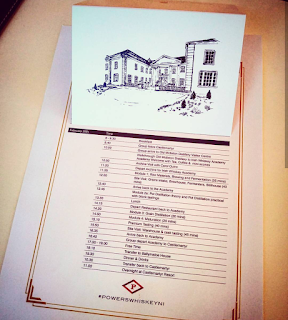 Some of the highlights mentioned, that the team were looking forward to, included the blending exercise and a visit to the Midleton archives. The discussion continued and as a result of the conversation, and I expect a little excitement, the journey seemed to pass us by in no time and before we knew it we had arrived at our temporary home for the next two nights, the five star Castlemartyr Resort, County Cork. I have to say though that staying in this exquisite hotel was not just a perk that came with this competition, as anyone who partakes in the "Enthusiasts Package" shall also get the chance to indulge in this fine retreat. After a long, albeit enjoyable journey, we were swiftly checked into our rooms and allowed a short time to relax before dinner in the resort's Italian restaurant and, of course, a few Powers whiskey nightcaps. The following morning we were up early, fed a fine breakfast and transferred the short distance to Midleton Distillery were we met our overall host for our visit Máire. Once we were warmly welcomed we met our Academy host and tutor Ciarán O'Donovan. Without any further ado we were off on our Irish Whiskey Academy experience which began with a comprehensive tour of the old distillery site. As we walked around, taking in a sense of it's history, we were shown that the location of the Irish Whiskey Academy straddles the area between the old distillery and the current production area, as almost as if it is a "gateway between the old and new". We continued onto to more modern buildings with a glimpse inside the ultra impressive micro distillery, where it seems that the team at Midleton are getting a chance to play at being Willy Wonka when it comes to producing whiskey. The micro distillery itself is made up of three beautiful stills and while no specific details were given away you certainly got a sense that the ethos is - if it can be done, then we are going to do it. From here we were shown around an impressive display of the history of coopering and maturation, and you can really see how much it means to everyone at Midleton distillery to understand this precious whiskey resource and the effect it bestows upon the liquid over many years of maturation. This led on perfectly to our next stop which was a small, but operational, warehouse containing 1000 casks of whiskey and, as with any whiskey warehouse, the smell was out of this world. Before getting into the serious business of learning all about the Irish whiskey process we were introduced to Carol Quinn, the Midleton archivist, who, as I'm sure you can guess, showed us some treats from the Midleton archives. This was were we got our first true specific insight into Powers whiskey, or should I say it's illustrious history. I was amazed as Carol talked us through the Powers history, telling us stories of how it was once a brand revered the world over from anywhere from France to South Africa to India. We also saw many photos and artefacts that highlighted exactly how exclusive this brand once was. Everything was thought of to showcase this brand, from an enormous, 30ft tall, handmade wooden round tower, that was built in and around the late 1800's and was covered with bottles of Powers whiskey, to even the original Powers labels themselves that achieved their golden colour from ground down bronze, which was a very expensive process when this first began, also in the late 1800's. When hearing the history of this iconic brand it is clear to see why those at Midleton want to keep it's name alive and, in turn, why it is now beginning to experience a renaissance as a brand that epitomises quality. It was also a pleasure to hear the Bullitt team quiz Carol at length on anything that came to mind. Coming from a background that would encompass all form of spirits you could tell that they were certainly impressed with the unique story that Powers whiskey had to tell. 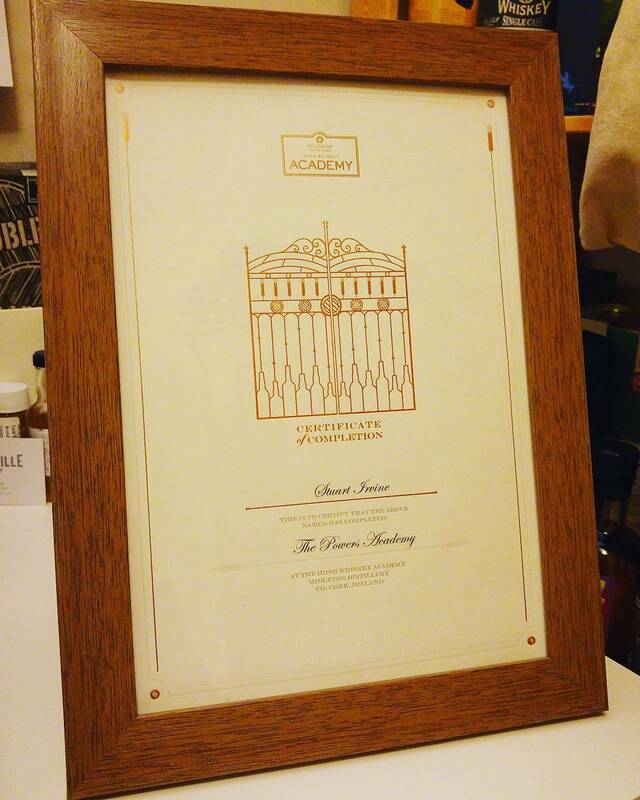 From the archives we returned to the Irish Whiskey Academy itself and began our tuition at the hands of our learned teacher Ciaran. Here we were taken, at great length, through every facet of the Irish whiskey making process. To begin we looked at the raw materials used and how they are brought together in the brewing and fermentation process. This included a chance to get back out on site and see for ourselves the huge storage areas where the grains are delivered to, along with a look inside the brewhouse and the "Barry Crockett" stillhouse. Normally the "Barry Crockett" stillhouse would be off limits to any visitors but, as Midleton's newer "Garden" stillhouse was undergoing some work to install new stills, we were granted a one off opportunity. Here we got a chance to see Midleton distillation happening before our eyes and it's impressive to think that every bottle of Jameson, Powers, Redbreast, Midleton VR, and so on, that you see on every shelf around the world, all originated from this stillhouse. This is of course due to the fact that any spirit distilled in the "Garden" stillhouse will take time to mature into actual whiskey that is ready to be included in one of these brands. From here we were back to the Academy for an in depth discussion into pot distillation along with a chance to taste some very unique liquids. From memory, I believe it was explained that the normal tasting, at this stage of the Academy, would be made up from standard components of what may be Jameson but our host Ciaran went a little further to try and secure some components of what would be used to create those whiskeys we would see with the Powers label upon them. If ever there was chance to really see what brings Powers whiskey together then this was it. Not only did this give all involved a real insight into Powers whiskey but also how the different styles of whiskey and maturation can really change how the final bottle will turn out. As you can imagine, after that extensive tasting, we were treated to some much needed lunch before heading back to the classroom to learn about grain whiskey distillation and the maturation process, which covered all the (known) woods that are currently being used at the Midleton distillery. With all the theory of Irish whiskey making covered it seemed about time to have some more samples and sure enough it was. This time however we were heading downstairs to the tasting room to be taken through the Powers whiskey range itself. This was now a chance to see how the components, that were tasted earlier, have been brought together to create the various styles of Powers that we now see in most bars. For me, this was the first time I had ever had the chance to try the full range side by side and to say it was enjoyable would be an understatement. Powers whiskey may have been overlooked for many a recent year but with this range of whiskeys behind them they can challenge any brand behind any bar. Chatting to the team from Bullitt you could also see them developing a new found appreciation for the whiskey in front of them with each person having a very different and interesting view on the flavours they were finding within the spirit. I dare say you may see a few new Powers cocktails coming very soon. Now after the component tasting, and the Powers tasting, I'm sure you can guess what it was time for now....yes, that's right, more whiskey, only this time it wasn't in the classroom or in the opulent tasting room. No, this time we were transported into the minor village that is made up by the Midleton warehouses and I'm not joking when I call it a minor village as there are around 45 warehouses on site storing a combined total of over 1.2 million casks of whiskey. For this final experience of day one we were taken into warehouse 39b and allowed to sample two whiskeys straight from the cask. Words can not express the excitement that is felt when, as a whiskey lover, you are allowed to remove and taste whiskey, straight from the cask, in the warehouse in which it has been maturing. I've experienced this on several different occasions and I can tell you it never gets old and all I can say is that if you ever get the chance to do this, anywhere in the world, jump at the opportunity. I believe that, for the team from the Bullitt Hotel, this was a first for each of them and an experience they'll never forget. This is a chance to taste Irish whiskey in it's purest form and they all certainly seemed to savour every last drop. 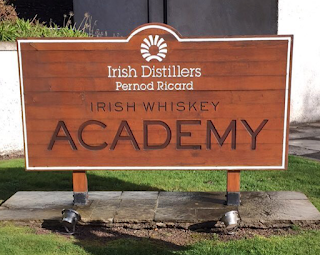 That concluded our first day at the Irish Whiskey Academy and it was time to head back to Castlemartyr for a couple of hours rest before the evening ahead. As part of the "Enthusiasts Package" you are treated to a hosted evening in one of Cork's premium restaurants and that is what this evening had in store. We were to be transferred to Ballymaloe House for what was to be a truly delicious dinner but not before an unexpected visit. While waiting in the Castlemartyr bar we were joined by none other than Midleton's "Master Blender" Billy Leighton, who had taken time out of his own busy schedule to come along to say hello and have a quick chat with all involved, including the team from the Bullitt Hotel. Following dinner we returned to Castlemartyr and as it was our last night we went about trying some of the more unusual whiskeys behind the bar which, in turn, led to some interesting purchases, or should I say some interesting methods of sale....those of you involved know what I mean. After a slightly shorter nights sleep it was a true shame to have to leave The Castlemartyr Resort but there was unfinished business to attend to at the Academy. We returned to our classroom to be thrown straight into our blending exercise, a module of the Academy that had been talked about from the moment we found out about it. We were paired off and sent to our blending stations where we had three very different whiskeys at our disposal. All necessary tools were provided and off we went creating the next Powers whiskey. For this exercise I was paired up with Frankie, from the Bullitt Hotel, and we set about creating two very different blends for sampling. Naturally you got the chance to sample each component individually, but in the end we settled on a blend that was composed of 50% Grain, 30% Bourbon matured and 20% Sherry matured. In honour of our time with Carol Quinn, in the Midleton archives, I named my blend "Round Tower", and you can expect it at a store near you very soon (I wish). That more or less concluded our time at the Irish Whiskey Academy and as "Enthusiasts" we were presented with a certificate of the course we had completed, named "The Powers Academy", a bottle of Powers "John's Lane" and an exclusive Irish Whiskey Academy book. 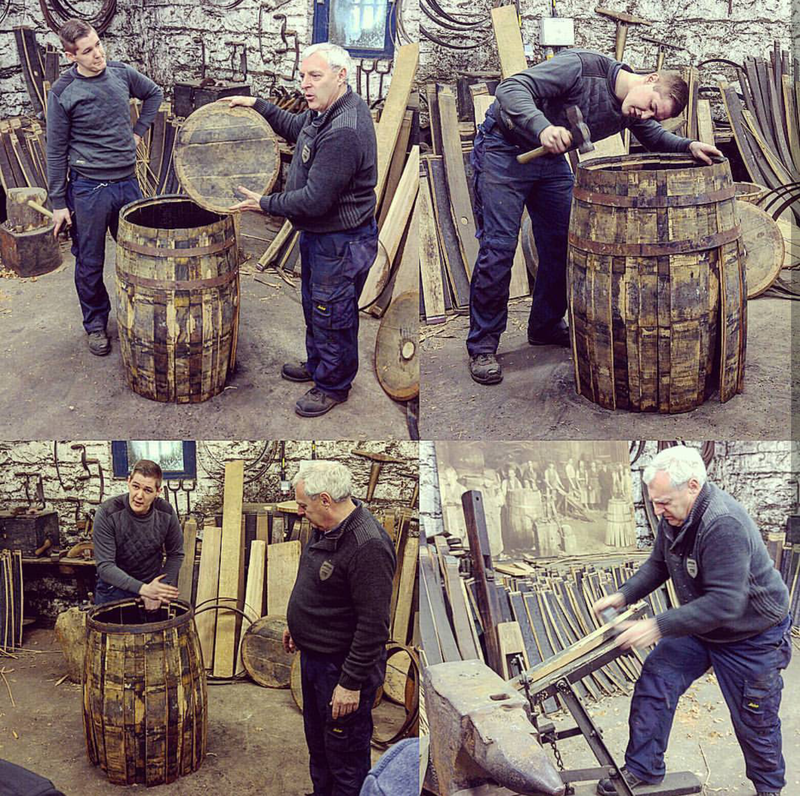 There was, of course, one last treat in store for all involved as we were led the short walk from the Academy to the on site cooperage for a display from Midleton's fifth generation master cooper Ger Buckley and his apprentice Killian O'Mahony. A display from Ger Buckley is without doubt an experience all in itself. The skills that this man possesses take years to master, as does the knowledge needed to handle the historic tools at his disposal. 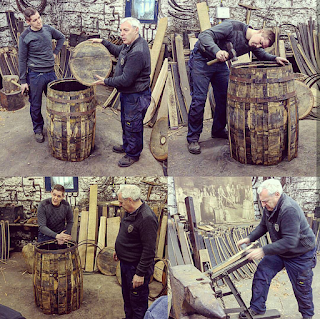 But what was abundantly clear, from our demonstration, is that, in the hands of Killian O'Mahony, Midleton's barrels will be well looked after for years to come. At this point we went back to the visitor centre to enjoy one last lunch, in the company of Ger and Killian, and afterwards we said our goodbyes to everyone, including our hosts Ciaran and Máire. A quick look around the gift shop, where a few other bottles may have been purchased, and we were off on the long journey home. The journey home was without doubt a little more tiring than the trip down but again the conversation flowed about everything we had experienced over the previous 2 days at the Academy. Thinking back over the whole trip what stood out for me was the aura that seems to surround Midleton distillery. No matter where you are everyone seems to know everyone on a first name basis and you get a sense that, even though the whiskey is being produced on a large scale, this is still very much run like a family business. This ties in perfectly with everything that was spoken about during our time with Carol Quinn and how Powers whiskey invested heavily in it's people which in turn created a sense of true pride towards the whiskey they were producing. This, in my opinion, is exactly what makes the whiskey coming out of Midleton, and more specifically Powers, the quality that it is. Each and every person, involved in the whiskey making process, has that pride in the job they do. Thinking about this makes me feel very reassured to know that, as we see Irish whiskey growing at the rapid rate it is, Midleton distillery is there to serve as a guide, to other distilleries, on how to achieve everything they hope for. Thinking now, more specifically, about Powers whiskey and I can honestly say that I have a far greater understanding of what makes this brand so great. It's history is almost unparalleled and we are now starting to see Midleton harness that rich history and turn it into a range of quality whiskeys that will soon have many people realising that this is a brand of whiskey that can sit amongst any in the world. Lastly I would just like to touch upon what I feel this whole experience meant to Frankie, Alex and Conor from the Bullitt Hotel in Belfast. I've no doubt that before this trip they were all well versed in most spirits, including whiskey, but as a result of this trip I also have no doubt that they now understand everything it takes to make great Irish whiskey. They can now appreciate the time and effort it takes to bring everything together to make that bottle of Powers whiskey that they serve to customers. They can now appreciate the delicate flavours that exist in each different bottle of Powers and how they could possibly develop those flavours into creating maybe a new delicious cocktail or just simply now having the knowledge to advise a customer that has maybe never tried a Powers whiskey before. But, maybe most important of all, they can now also appreciate the history and pride that exists throughout the entire Powers range and this can, in turn, allow them to pass this knowledge on and, furthermore, allow the great story of Powers Irish Whiskey to be passed on for many more years to come. 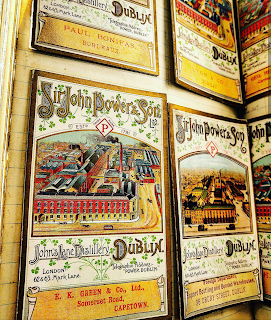 For years Irish whiskey has been relying exclusively on three main distilleries to produce a range of spirits to sell the world over and help build the now rejuvenated reputation of Irish whiskey. These distilleries are obviously Midleton, Bushmills and Cooley. In recent times though we have seen a new wave of Irish distilleries appearing on the scene, all with their own ambition to start to diversify the range of Irish Whiskey available to the general public. One of these distilleries is Dingle. 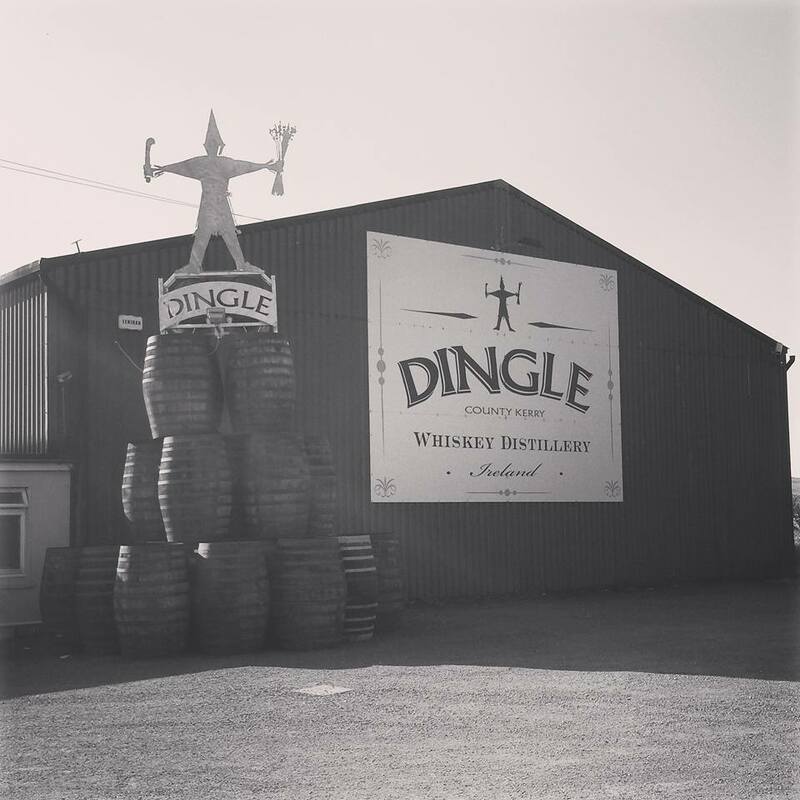 Situated in the South West of Ireland, on the "Wild Atlantic Way", Dingle Distillery was created in 2012. Using their three gorgeous pot stills, the first spirit to be distilled in Ireland, outside the big three of Midleton, Bushmills and Cooley, ran from their stills back in November 2012. Reading through their website, you can see that a key point in their whiskey making process is the design of their stills. They deliberately opted for spirit stills that would create extra reflux during the distilling process, allowing them to create a finer spirit to be filled into their ready waiting casks. Their small, but "artisan", set up only allows them to create enough spirit to fill around two casks per day, so in their own words they understand they may never be a global megabrand, but having visited the distillery myself I can tell you that their passion, and will to succeed, is no less than any large distillery you would find anywhere on the planet. With the main stills running, they set about creating single malt and pure pot still whiskey, and while waiting for these spirits to mature they also released their own brand of gin and vodka, which I'm sure many of you have already seen in a few bars, or off licences, around Ireland. Now when it comes to maturing your own whiskey, a lot of people would have different views on how and when your first release should arrive. 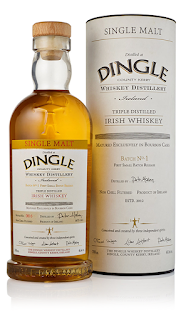 Some may say that you should wait for at least 5 - 6 years, allowing the cask to mellow your spirit, before allowing the public to form any opinion about what you are producing but Dingle kicked that idea firmly into touch by releasing their "Batch No.1" in late 2016, when the whiskey would have been around a very late 3 years old. Some may ponder if a much needed injection of funds was the driving force behind such an early release but, having tasted "Batch No1" myself, I would say it's nothing more than a solid vote of confidence behind the spirit and whiskey they are producing in Dingle. The first release of "Batch No.1" was a triple distilled single malt and it arrived in two forms, one of which was bottled at a healthy 46.5% ABV while the other was a much bolder cask strength version. Needless to say, demand for both versions was phenomenal and most retailers saw their stock disappear before they could believe, but I now believe that a second release of "Batch No.1" is back on the shelves. On a recent trip to Dublin I happened to pop into the whiskey shop attached to The Temple Bar itself. Inside the store they had a nice selection of whiskeys along with many open bottles if you wished to purchase a measure. As I'm sure you can guess I quickly spotted a 46.5% ABV bottle of the Dingle Single Malt "Batch No.1". I've waited a long time to sample any official Irish whiskey, other than that of the big three, so naturally I purchased a glass and set about jotting down some tasting notes. Now before I move onto my notes I'd like to point out, if it even needs to be said, that this is obviously very young whiskey and only an indication of where the distillery is at now and where it is headed in years to come. Nose - Undeniably young with that peppery, new make, clove rock coming right through the spirit. Once you let it settle a while you pick up lovely notes of citrus with lemon biscuits seeming to dominate. The citrus is also represented by some light candied orange peel and a malted sweetness comes through also. Now for the "Dingle" effect which is something I haven't really experienced in an Irish whiskey to date. Running throughout the whiskey is a deliciously rich, salted butter undertone. The salt note, I can only presume, has obviously come from that gorgeous North Atlantic air sweeping off the coast where Dingle is situated. This is really good for such a young age. Palate - Clean, crisp arrival that leads to more of the sweet malt and touches of pepper. The citrus also continues along with the obvious bite of youthful new make. At 46.5% ABV I was hoping for a much thicker coating around the mouth but the creamy butter element is still here to bring a little richness to the experience. Finish - Crisp with lemon, apple and warming spices. Overall this has really impressed me. Without doubt this is a young whiskey but it is already starting to display a tasty richness in the spirit and is, in my opinion, already starting to take on some coastal elements from the maturation process. This, as a first release, is one to look out for and try for yourself. I honestly don't think Dingle Distillery could have asked for more to come out of this whiskey. You can clearly see that their commitment to producing quality whiskey is there in the glass and, for me, this is a whiskey that is only going to get better, and better over time. They will obviously be restricted to do this, but I hope they can bring out some form of release year on year so that we can all see exactly how well this delicious spirit is progressing. 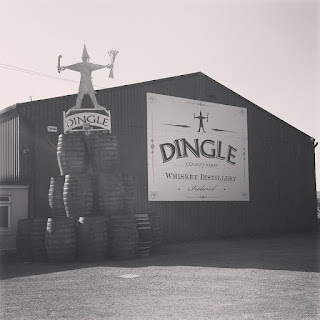 It has always been a concern, of every lover of Irish whiskey, to see if all these new distilleries could actually walk the walk after talking the talk, but if you can manage to get a glass of Dingle Single Malt in your hand you can taste for yourself that Dingle are firmly on two feet and already walking in the right direction. Time flies when you're having fun!! 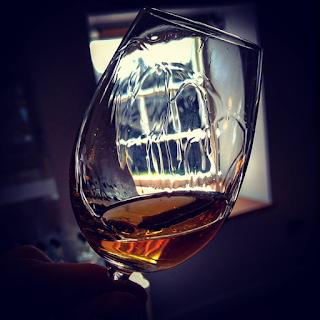 It seems like only yesterday that I was sitting myself down to enjoy a sample of the Midleton Very Rare 2014, the first to be bottled under the watchful eye of Master Distiller Brian Nation. Fast forward to the present day and we now have Brian's third release of the iconic Midleton Very Rare. 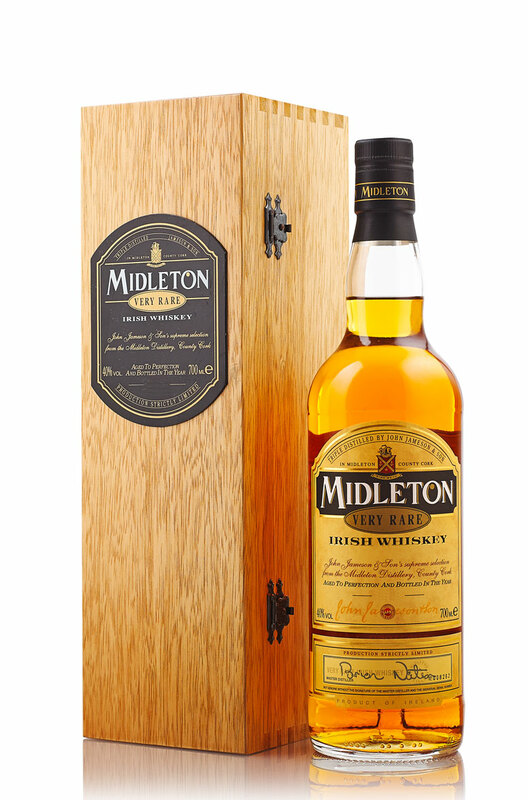 First launched in 1984 the Midleton Very Rare is a yearly release of 50 exceptional casks that have been handpicked by the Master Distiller and blended together to showcase all that the distillery has to offer. Since taking over the role of Master Distiller I know that Brian Nation has already overseen many other new releases, across the whole Midleton portfolio, but with the Midleton Very Rare, being so revered the world over, it will be interesting to see if he is starting to make his mark on this famous whiskey. Nose - Upon first pour I immediately pick up some vibrant orchard fruits with fresh green apple to the fore. Once this settles down there's a gorgeous mix of pot still spices and cream. The spice is prickly with a touch of ginger and pepper. The creamy vanilla is deliciously smooth and binds the nose together. The orchard fruits become slightly more stewed and combine with the grains to give a sense of apple crumble. As it develops I now get some of the tropical notes I've noted in previous Very Rare releases with light banana / foam banana sweets. A very classic Midleton nose. Palate - Clean and crisp with green apples continuing from the nose. Spicy pot still character also comes through and combines with the grain to play around the mouth. Cask influence adds an extra dry spice whilst enhancing the vanilla notes. Throughout the whiskey there is a underlying toffee sweetness but this is kept in check by the grain spirit which seems to be a major player in this whiskey. With time a little stewed orange comes through and the experience becomes a lot richer. Finish - Dry, spicy and very fruity. Overall this is another excellent addition to the Very Rare range. Thinking back to my previous experiences this 2016 release doesn't seem to have just as much citrus, as what I may have experienced before, but this seems to have been replaced with an fresh orchard element. Whilst the sweetness is still easily found within this whiskey it feels like it has taken more of a back seat to allow the natural spirit to shine through. This is applicable for both the pot still and grain elements with both combining well to hold the whiskey together. For me this is the quintessential Irish whiskey showcasing the perfect blend of spirits to achieve something that is much more than the sum of it's parts. I certainly get the sense that Brian Nation is making his mark on this whiskey and it's a taste journey that will develop brilliantly over the years. Having first started in 2003, West Cork Distillers are a company I have heard different stories about without actually ever getting a chance to try any of their whiskeys. I was therefore only too happy when I recently got the chance to get a couple of samples and see exactly what they have to offer. Like I said the company has been on the go since 2003 and in 2013 they moved their distillery into larger premises based in Skibbereen, West Cork. They are responsible for a range of whiskeys, vodka and liqueurs with brands such as Drombeg, Two Trees, Lough Hyne, Kennedy and of course their West Cork Whiskey. With regards to the whiskey side of things, they can boast an ever increasing range with two blends to accompany a range of aged and finished malts. 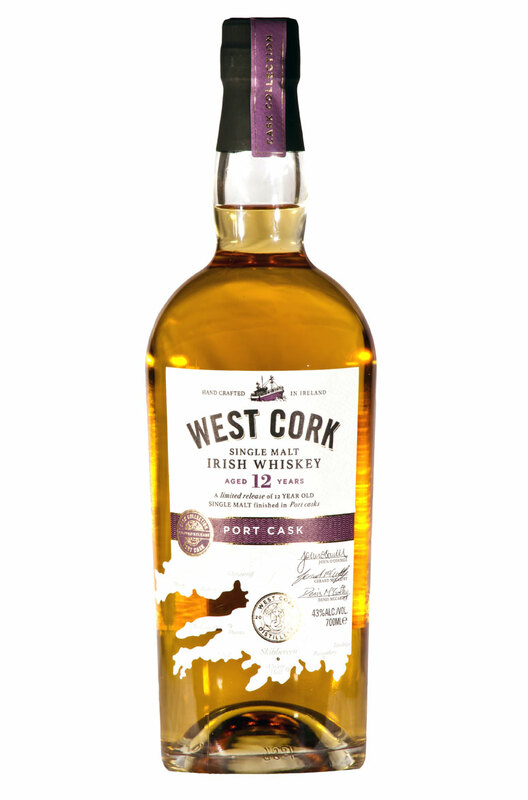 Moving on to this review, one of the samples I recently received was of the West Cork 12 year old Single Malt - Port Cask Finish. From looking about online, it's pretty hard to get much detail behind the whiskey but it seems that it has had a short finish in a port cask before being bottled at 43% ABV. They are very clever to neglect to mention whether the malt is double or triple distilled so as to obviously disguise the origin of the original spirit. I am not sure where the company are at with their own distilled spirit but I would probably guess that the current range may have started it's life in Co. Louth (if you know what I mean). As with a lot of other new Irish whiskeys I've no doubt that West Cork are carrying out the finish themselves so there is still a lot of room for them to stamp their own flavour onto the whiskey. The question is can they deliver? Let's find out. Nose - Initially this is a bit tricky to get to grips with as the obvious tropical notes battle with the port finish for dominance. As it develops the tropical flavours win the battle with fresh banana, banana cream, a little green apple and a touch of lemon zest zing. The Port still finds time to come through with a little blackcurrant and raspberry. It would almost put you in mind of "Fruits of the Forest" yoghurt with the cream notes still coming through also. Any idea of spice is very restrained with only the mildest of pepper lingering under the fruits. With time the darker Port fruits marry with the citrus element to bring out a little orange. Very nice actually. Palate - Initially it's all more of the same with citrus and banana giving way to red berries and a little more spice. Deeper lemons and oranges are to the fore with the black pepper and clove coming through nicely. The berries are also a lot deeper with distinct blackcurrant tailing off into a little more green apple. The fruits on the palate are definitely a lot more richer in nature and I have to say this works really well. Finish - Deep, juicy, Port wine berries, a little dry spice and sour apple sweets to finish. Overall I have been pleasantly surprised by this whiskey. Like I said I had heard a lot of different things about West Cork Distillers but it's only when you actually try a product should you form your own opinion. What I've discovered is that they certainly seem to have good malt whiskeys under their control and they also seem to know how to pack some extra flavour into them with good finishes in good casks. The price point is also very decent too with the 12 year olds setting you back about €50, or about £45 at current exchange rates. 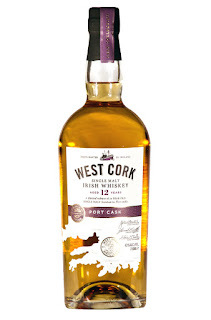 At these prices I'd definitely recommend this whiskey and West Cork Distillers are a company I shall be keeping a close eye on as they move forward. Well over a year ago Irish whiskey lovers were treated to something special from the Teeling Whiskey Company as they released their first ever "Revival" bottling. This first release was a 15 year old single malt, matured exclusively in rum casks, and was introduced to mark the opening of the new Teeling Whiskey Distillery in Dublin city centre. 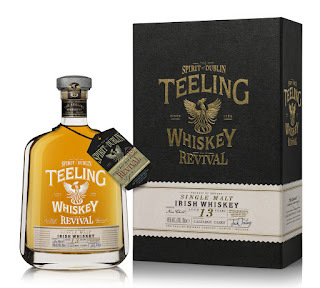 Moving on to the end of last year and we witnessed as Teeling released "The Revival - Volume II" to mark the one year anniversary of the Teeling Whiskey Distillery. This "Second Coming" is a 13 year old single malt that was distilled in 2002 before being initially matured for about 12 years in ex-bourbon casks. It was then finished for a further 12 months in an ex-Calvados, French apple brandy, cask. It has then been bottled at 46% ABV and without chill filtration. Nose - Orange, lemon, cut grass, honeyed lemon with lovely wafts of sweet malt barley. Clean and distinct. A little tropical banana with a nod towards banana ice cream. Orange marmalade, dried orange, candied lemon peel. Not a lot of spice going on here which allows it to come across as a fruit explosion. Green and red apple which come across both as fresh and stewed. Beautiful mix of sweet fruit salad. Palate - Rich malt with a seriously rich citrus undertone. Sweet orange and lemon combine with a little spice which arrives with the feeling that it's more from the casks than the spirit. Apart from that the oak influence is restrained with the flavours from the Calvados having a lot more of a say. Ripe red apples and a little more of the green, cut grass note from the nose. The sweetness is almost overpowering on the palate but the savoury green element, along with a minor amount of spice, just about hold it all together. Finish - Long and juicy with a little hint of dry wood spice. This then disappears into a heady blast of ripe red apples. Overall I have to say, I prefer this much more to the first release. This is one fruit beast of a whiskey. A full fruit salad is on display with top notch sweet malt. Cask influence is restrained but having just enough of a say to bind everything together with a little cream from the oak. This is a seriously good Irish whiskey and has classic notes which are now found regularly throughout the Teeling range. Think I may have to splash the cash on a bottle of this, very impressive. Bushmills - 12 year old "Distillery Reserve"